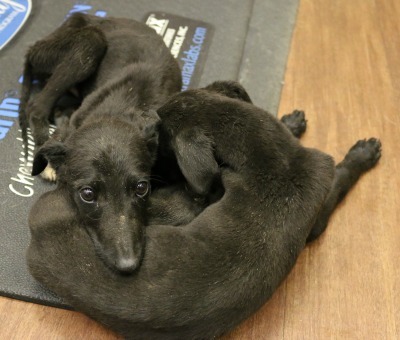 Butch is an approximately 6 week old black male greyhound puppy and sibling to Etta. Butch arrived with George, Lady Bird, Laura, Classy, Lyndon and Etta from a horrific cruelty seizure in West Texas. 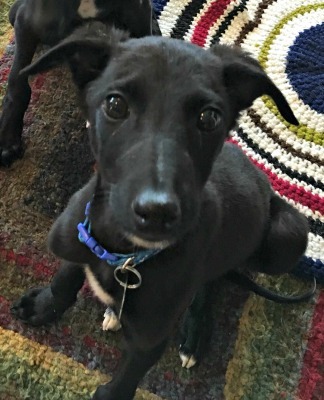 Butch, along with Etta, was initially in the care of Dr. Wick Culp of Animal Medical Center in Amarillo,, and is now under the care of Dr. Christy Soileau of VCA Preston Park VCA Preston Park Animal Hospital. 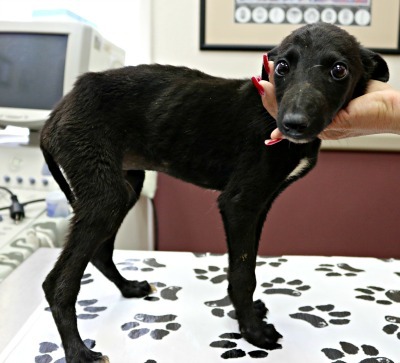 When he arrived, Butch was dehydrated, very thin and anemic due to his burden of a large load of intestinal parasites. He is being fed very small meals multiple times a day in an effort to slowly gain weight. Treatment for the parasites has started also. Please note 2016 Grant Challenge/Butch on your check.